PICTURE TAKEN WHEN CARISMA WAS YOUNG. IS YOUNG ENOUGH TO HAVE A FEW MORE. SHE ALSO HAS 14 POINTS IN PACK & 20 IN PUBLIC RELATIONS. SHE HAS HAD 2 HALTER GRAND CHAMPIONSHIPS & 5 RESERVE CHAMPIONSHIPS. ALSO IN PERFORMANCE SHE HAS HAD 1 GRAND CHAMPIONSHIP & 1 RESERVE. SHE IS AN ABSOLUTE SWEETHEART! 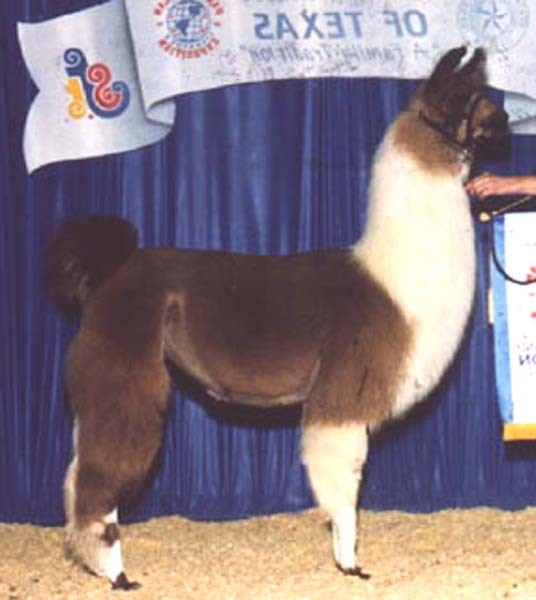 CARISMA IS BRED TO SHEAR IMAGE FOR A SPRING 2010 CRIA.